Anthology Film Archives working in collaboration with 60 of the world's leading film archive collections including British Film Institute, George Eastman House, The Library of Congress, and The Museum of Modern Art, among many others, prepared preservation and restorations masters of these rare art films. Many of the films have not been available since their creation over a century ago, some have never been screened in public, and almost all have been unavailable in pristine projection prints until now. 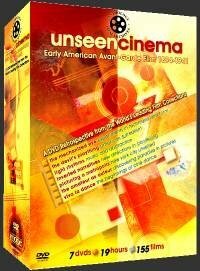 Unseen Cinema film retrospective had its world premiere at the 23rd Moscow International Film Festival in June 2001 and its United States premiere at The Whitney Museum of American Art (July-September 2001). The films have been seen at museums, archives, universities, and theaters around the world. Over 50 venues have featured the touring programs making it one of the largest and perhaps the most viewed film retrospectives in history. The films are available for worldwide exhibition as a complete 20 program retrospective or as individually selected single programs tailored to meet the needs of less ambitious presentations. The dynamic qualities of motion pictures are explored by cameramen and filmmakers through novel experiments in technique and form. Early cinematographers James White, "Billy" Bitzer, and Frederick Armitage display experimental shooting styles that wowed audiences. Other independent companies further image manipulation through creative staging, editing, and printing, such as a stunning three-screen film that predates Gance's Napoleon. Experiments by photographer Walker Evans, painter Emlen Etting, musician Jerome Hill, and the film collectives Nykino and Artkino record the world in a continual process of flux. A most extreme approach is realized by Henwar Rodakiewicz with Portrait of a Young Man (1925-31), a monumental study of natural and abstract motions. Edwin S. Porter and other early filmmakers used bizarre sets, fantastic costumes, and magic lantern tricks to illuminate their fantasy films. American parody supplied Douglas Fairbanks with enough unusual material to produce the truly surreal When the Clouds Roll By (1919). The expressionistic Cabinet of Dr. Calagari (1919) influenced American sensibilities throughout the 1920s as seen in Beggar of Horseback (1925), The Life and Death of 9413-A Hollywood Extra (1927) and The Telltale Heart (1928). The emphasis shifted when amateurs J.S. Watson, Jr., Joseph Cornell, and Orson Welles crafted a unique variety of American surrealism on film unfettered by European concerns. The rhythmic elements of cinema are explored by artists and filmmakers fascinated by the abstract qualities of light. The American authors of avant-garde classics Le Retour á la raison (1923), Ballet mécanique (1923-24), Anémic cinéma (1926), and Une Nuit sur le Mont Chauve (1934), are finally acknowledged for their seminal artistic achievements made in Europe. Pioneer abstract films by Ralph Steiner, Mary Ellen Bute, Douglass Crockwell, Dwinnell Grant, and George Morris are compared and contrasted with Hollywood montages created by Ernst Lubitsch, Slavko Vorkapich, and Busby Berkeley. For the first time on video, composer George Antheil's original 1924 score accompanies Fernand Léger and Dudley Murphy's film Ballet mécanique, a truly avant-garde cacophony of image and sound. Early directors D.W. Griffith and Lois Weber develop the radical language of cinema narrative through audience-friendly melodramas made for nickelodeon theaters. Experimental fantasies are depicted in such independent productions as Moonland (c. 1926), Lullaby (1929), and The Bridge (1929-30). Depression era films by socially-conscious filmmakers reshape drama as demonstrated in Josef Berne's brooding Black Dawn (1933) and Strand and Hurwitz's biting Native Land (1937-41): each pictures a raw reality. Parody and satire find their mark in Theodore Huff's Little Geezer (1932) and Barlow, Hay and Le Roy's Even as You and I (1937). David Bradley's Sredni Vashtar by Saki (1940-43) boasts an inadvertent post-modern attitude. The DVD depicts dynamic images of New York City and scenes of New Yorkers among the skyscrapers, streets, and night life of America's greatest city during a half century of progress, while at the same time showing changes in film style and the history of cinema experiments. Avant-garde moments pop up in the most unlikely of places including turn-of-the-twentieth-century actualities, commercial and radical newsreels, and Busby Berkeley's "Lullaby of Broadway" from Gold Diggers of 1935. Included are spectacular prints of Charles Sheeler and Paul Strand's Manhatta (1921), Robert Flaherty's Twenty-four-Dollar Island (c. 1926), Robert Florey's Skyscraper Symphony (1929), Jay Leyda's A Bronx Morning (1931), and Rudy Burckhardt's Pursuit of Happiness (1940). These home-made films incorporate avant-garde strategies and techniques to achieve a true sense of cinematic intimacy. Glimpses of life caught unawares are found in the home movies of Elizabeth Woodman Wright, Archie Stewart, Frank Stauffacher, and John C. Hecker. Poetic lyricism finds a voice in city symphonies: Lynn Riggs and James Hughes' A Day in Santa Fe (1931) and Rudy Burckhardt's Haiti (1938). Professionally minded films, like Theodore Case's sound tests (c. 1925) and Lewis Jacobs' Tree Trunk to Head (1938), operate from a similar home-spun perspective of sincerity. Joseph Cornell offers an enigmatic but lovely homage to childhood with Children's Trilogy (c. 1938). Dance and film have shared the aspiration to creatively sculpt motion and time. Some of the first films ever made featured Annabelle's skirt dance, hand-painted in glowing colors. Isadora Duncan and Ruth St. Denis' innovations found their way into Diana the Huntress (1916) and The Soul of the Cypress (1920). Highly cinematic renditions of dance evolved in Stella Simon's Hände (1928), Hector Hoppin's Joie de vivre (1934), and Busby Berkeley's "Don't Say Goodnight" from Wonder Bar (1934). In counterpoint, ciné-dances by Mary Ellen Bute, Douglass Crockwell, Oskar Fischinger, Norman McLaren, Ralph Steiner, and Slavko Vorkapich dispensed with actual dancers in favor of color, shape, line, and form choreographed into abstract light-play.